This page allows you to register your own nameservers under your domain names, this is useful when you have a VPS server or a dedicated server. Note: To remove a nameserver, just hit the Delete button next to the required nameserver. You can only edit IPs for a nameserver, if you need to edit the name of a nameserver, you will need to delete it totally. If it is a UK domain, for some reason you are unable to delete nameservers, you can only change a nameserver's IP. In this box there's 2 fields, one for the actual nameserver, eg. "anything.yourdomain.com", and one for an IPv4. There is no support for IPv6 yet. The "Nameserver" must contain your domain name. The IPv4 has to be different for each nameserver. It is ideal you register at least 2 nameservers, therefore, you will need two separate IPv4 addresses. 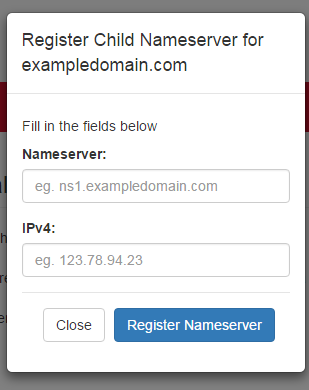 If you wish for your domain to use the Child Nameservers, after registering them, you will need to enter them on the main Nameservers page. In this box there's 2 fields, one cannot be edited, the name of the actual nameserver, the other for an IPv4, which is changable. There is no support for IPv6 yet. 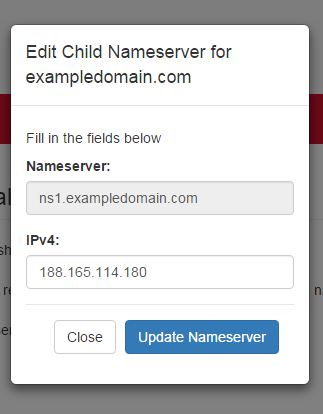 The IPv4 has to be different from other nameserver IPv4s. Apart from UK domains, you are able to delete nameservers. You just click "Delete" for the specific nameserver you require to delete, and then click "Yes" on the confirmation pop-up.